Today’s beekeepers face unprecedented challenges, a fact that is now front-page news with the spread of “colony collapse disorder.” Newly introduced pests like varroa and tracheal mites have made chemical treatment of hives standard practice, but pest resistance is building, which in turn creates demand for new and even more toxic chemicals. In fact, there is evidence that chemical treatments are making matters worse. It’s time for a new approach. In this set, which includes the new, full-color, Natural Beekeping, Revised and Expanded Edition, and a DVD workshop, Ross Conrad brings together the best “do no harm” strategies for keeping honeybees healthy and productive, all of which are covered in a thoughtful, matter-of-fact way. Natural Beekeeping covers nontoxic methods of controlling mites; eliminating American foulbrood disease without the use of antibiotics; selective breeding for naturally resistant bees; and many other detailed management techniques, which are covered in a thoughtful, matter-of-fact way. Whether you are a novice looking to get started with bees, an experienced apiculturist looking for ideas to develop an integrated pest-management approach, or someone who wants to sell honey at a premium price, this is the book you’ve been waiting for. In this filmed workshop, Ross Conrad flips the script on traditional approaches by proposing a program of selective breeding and natural hive management. The video presents a comprehensive survey of natural beekeeping methods and challenges, including segments filmed in thefield. It offers practical information that every aspiring beekeeper needs to know—everything from basic hive equipment to working with your bees to harvesting and processing honey. 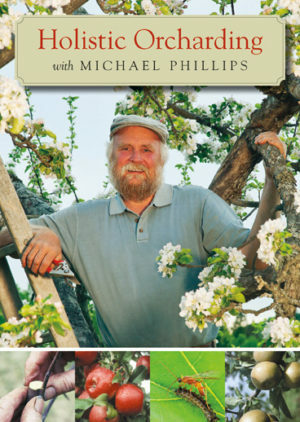 Michael Phillips is a pioneering author and orchardist whose books include The Holistic Orchard and The Apple Grower. In this video, he leads viewers through a year in his own orchard, demonstrating basic horticultural skills like grafting and pruning, but also revealing groundbreaking and field-tested strategies for growing apples and other tree fruits not just organically, but holistically. With this information in hand, there’s now every reason to confidently plant that very first fruit tree! Ross Conrad is the author of Natural Beekeeping (Chelsea Green, 2007), where he brought together the best organic and natural approaches to keeping honeybees healthy and productive. 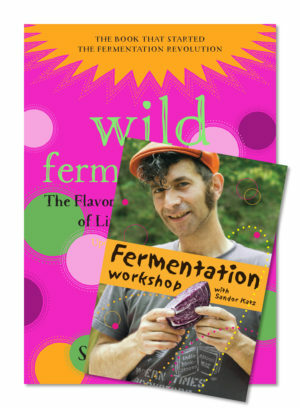 In the book, Conrad offers crucial nontoxic methods of controlling mites, eliminating American foulbrood disease (without the use of antibiotics), breeding strategies, and many other tips and techniques for maintaining healthy hives, as well as specific concepts and detailed management techniques covered in a matter-of-fact, easy-to-implement way. The book describes opportunities for the seasoned professional to modify existing operations, increase profits, and eliminate the use of chemical treatments. In this instructive video, New Mexico beekeeper Les Crowder shares his thirty years’ experience in developing best practices for working with bees in top-bar hives. Les and Heather Harrell, authors of Top-Bar Beekeeping (Chelsea Green, 2012) discuss everything from hive management techniques to how to harvest and process honey and beeswax to the best plants to grow for the foraging bees. The natural, low-stress methods outlined in this video are perfect for home or hobbyist beekeepers who have the time and interest that’s necessary to manage bees intensively and holistically. The material will also be valuable for home orchardists, gardeners, and permaculture practitioners who are interested in bees as pollinators, as well as for their honey and beeswax. In this filmed workshop and interview, recorded at the Northeast Organic Farming Association (NOFA) Winter Conference in 2010 and at Cate Farm, longtime farmer Richard Wiswall shares his story, and offers detailed advice on how to make your farm production more efficient, better manage your employees and finances, and turn a profit. From his thirty years of experience at Cate Farm in Vermont, Wiswall knows firsthand the joys of starting and operating an organic farm – as well as the challenges of making a living from one. Farming offers fundamental satisfaction from producing food, working outdoors, being one’s own boss, and working intimately with nature. But, unfortunately, many farmers avoid learning about the business end of farming, and because of this, they often work harder than they need to, or quit farming altogether because of frustrating – and often avoidable – losses. This workshop offers invaluable exercises for business-savvy farmers, including information on the costs of running a farm, office and bookkeeping management, creating a budget and crop enterprise plan, and getting down the the nuts and bolts of business management, that’s easy to understand. Through in-the-classroom footage and step-by-step guidance to “sharpening the pencil”, as well as footage of Wiswall’s fields, greenhouse, and barn, viewers will leave this “workshop” knowing how to achieve true profit, that will last for years to come. Also included is a bonus disc with downloadable spreadsheets for creating your own budget, marketing, profit and loss statement, balance sheet, and cash flow. In this book and DVD set longtime farmer Richard Wiswall shares his story, and offers detailed advice on how to make your farm production more efficient, better manage your employees and finances, and turn a profit. From his twenty-seven years of experience at Cate Farm in Vermont, Wiswall knows firsthand the joys of starting and operating an organic farm—as well as the challenges of making a living from one. Farming offers fundamental satisfaction from producing food, working outdoors, being one’s own boss, and working intimately with nature. But, unfortunately, many farmers avoid learning about the business end of farming, and because of this, they often work harder than they need to, or quit farming altogether because of frustrating—and often avoidable—losses. The DVD consists of a filmed workshop and interview, recorded at the Northeast Organic Farming Association (NOFA) Winter Conference in 2010 and at Wiswall’s Cate Farm. This workshop offers invaluable exercises for business-savvy farmers, including information on the costs of running a farm, office and bookkeeping management, creating a budget and crop enterprise plan, and getting down the the nuts and bolts of business management, that’s easy to understand. Through in-the-classroom footage and step-by-step guidance to “sharpening the pencil”, as well as footage of Wiswall’s fields, greenhouse, and barn, viewers will leave this “workshop” knowing how to achieve true profit, that will last for years to come. Also included is a bonus disc with downloadable spreadsheets for creating your own budget, marketing, profit and loss statement, balance sheet, and cash flow. A companion CD in the book also offers valuable business tools, including easy-to-use spreadsheets for projecting cash flow, a payroll calculator, comprehensive crop budgets for forty different crops, and tax planners. 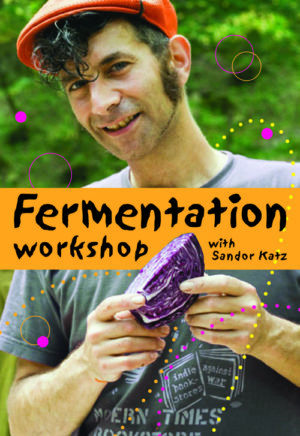 Thousands of readers consider Sandor Ellix Katz’s Wild Fermentation to be their guidepost for exploring and making fermented foods. Now, in this new DVD, Katz offers fermentation beginners and enthusiasts a chance to “sit in” on one of his popular workshops and learn through hands-on demonstration and instruction, accompanied by an interview on the benefits of fermentation, and social implications as it relates to food security. The hero of the story, Elzéard Bouffier, spent his life planting one hundred acorns a day in a desolate, barren section of Provence in the south of France. The result was a total transformation of the landscape-from one devoid of life, with miserable, contentious inhabitants, to one filled with the scent of flowers, the songs of birds, and fresh, flowing water.